Live Well... Lifestyle Solutions for a Happy Healthy You! ATLANTA - In a world where people seek solutions for balance, happiness and excellent health, “Live Well: Lifestyle Solutions for A Happy Healthy You!” emerges to meet their healthy lifestyle needs. Leesa Wheeler, who delighted poetry lovers with her debut collection, Melodies From Within, learned from her life experiences that it is through simple acts that one can have the greatest impact. Because of these experiences, she is convinced that one’s health is the product of the hundreds of seemingly small choices one makes every day. In “Live Well” readers will find practical lifestyle solutions for increased health and decreased dis-ease. Throughout the book the central message rings clear: “What you eat, what products you use on your body and in your home, how you talk to yourself – it all matters!" As a Healthy Lifestyle Coach with an emphasis on allergies and wellness, Leesa Wheeler teaches her clients to make informed choices and enables them to make needed changes for a happy healthy life. In the wake of life’s most crushing blows, the sun still rises, nature still dazzles and loved ones still wait, eager to comfort and heal. 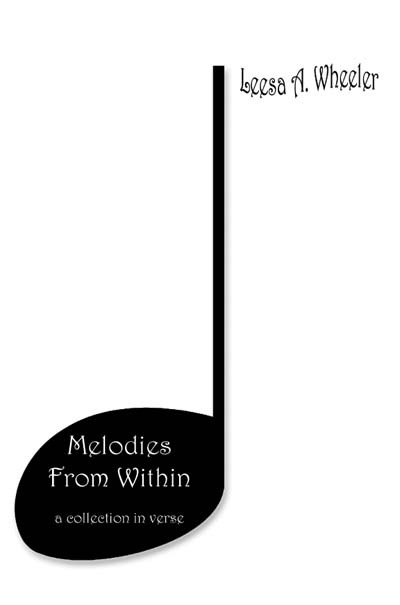 In her new book, Melodies From Within: a collection in verse, Leesa A. Wheeler radiantly portrays these magical moments and illustrates how they can transform tragedy into powerful lessons from which to grow. A veritable miracle, Melodies From Within was written after Wheeler endured her own tragedy. On her 37th birthday, she suffered a brain hemorrhage that left her unable to talk, read or write. But the need to express is a powerful force. Wheeler overcame her physical limitations and eventually filled the promise of a blank page with the beauty her soul never stopped observing in the world around her. “The poems in this collection are a compilation of my life experiences,” Wheeler writes. “During my life, I’ve found my most memorable moments have been blessings discovered from facing challenges.” From the joy of turning seasons to the people and times that call for deep contemplation and thankfulness, each piece delves deep into intriguing topics that invite and inspire. On its way to a final destination. A refreshing, inspiring experience for all poetry lovers, Melodies From Within releases an irrepressible song of joy from one woman’s soul. 1) an occupation or profession, especially one requiring special training, followed as one's lifework. 2) a person's progress or general course of action through life or through a phase of life, as in some profession or undertaking. 1) the force that makes or keeps something alive; the vivifying or quickening principle. 2) the course of existence or sum of experiences and actions that constitute a person's existence. 1) to give instruction or advice to in the capacity of a coach; instruct & lead. These definitions and more are what Leesa is as a professional but more to the point, as a person. She is insightful and pro active as she is unwavering and tenacious. It's truly impossible for me to convey exactly how many different ways Leesa's heart felt energy has given me such aspiration to believe and rediscover myself again.